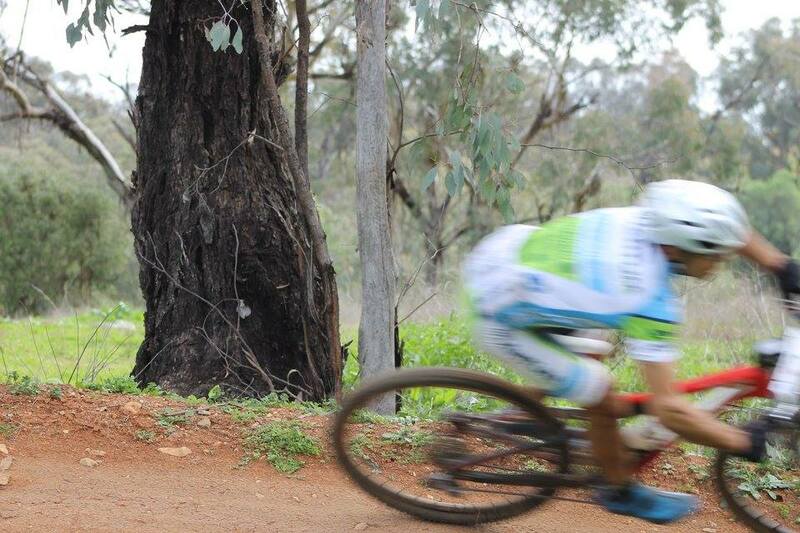 The Albury 6 hour has been a favourite race of mine. Over the years I’ve raced there, I’ve had such exciting events as mangling a drivetrain, going hypothermic in a winter blizzard, forgetting all my food and racing 6 hours on about gels, or possibly even having my car fail to start in order to get there in the first place. 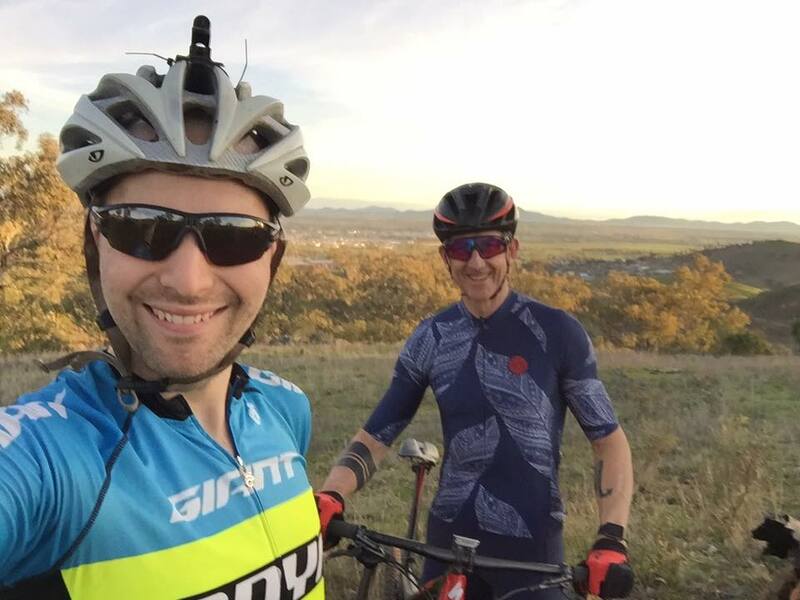 Let’s cut to the chase: Albury is a fantastic place to race bikes, even with a distinct tendency to invoke misadventures. The trails at Nail Can hill are set into natural scrub, with plenty of climbing, and an abundance of natural rocky terrain, including greasy off-camber chutes and harrowing descents. 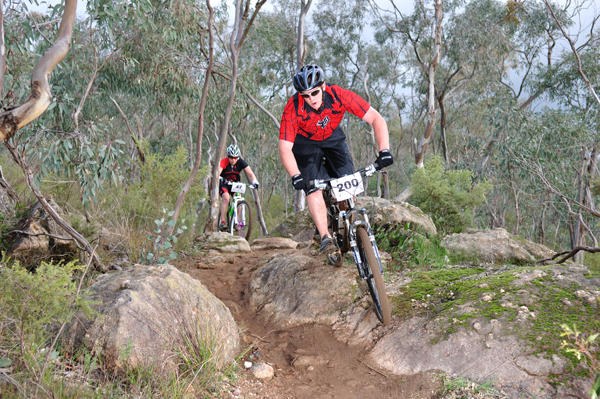 Typical Albury terrain – fun! To old school mountain bikes – rocks rock. A technical test demanding a push, and the limit of the bike’s traction, technically discriminating, natural, and oh-so-rewarding. Rocks change according to the conditions, and open up line after line of opportunity. To be honest, in the modern age of 64-degree-head-angle-#enduro#sleds that need giant six foot berms to get around corners without blowing new lines, rocks are an endangered species. While the fact that enduro bikes are basically the mountain bike equivalent of soft-roading SUVs (with more incoherent rambles to come upon that topic at a later date) may actually have little to do with that, it felt pretty exciting to be racing tight, technical and rocky trails. 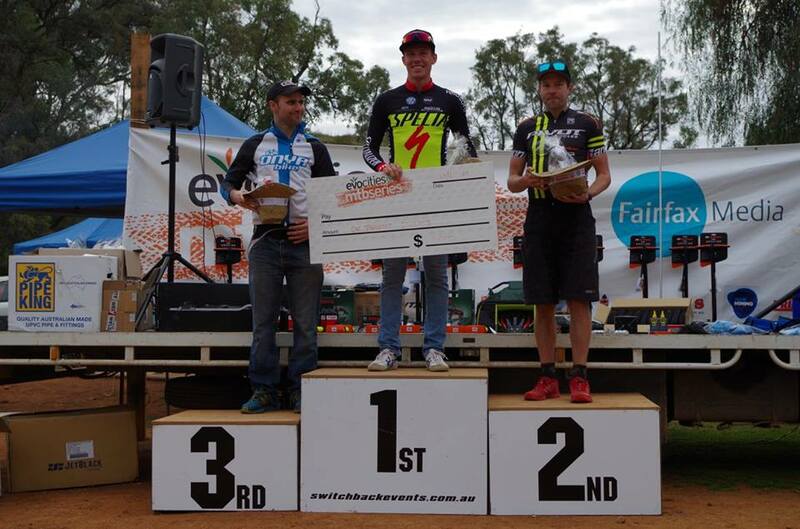 The Albury 6 Hour also helped me define a few riding cliches, with a wildly divergent personality through various phases of the race, aptly enabled by the lingering presence of a rather nasty flu. The race start up a fire-road always brings on the offset of the reckless racer boy. The reckless racer boy is the one who, charging off the start line, seems dangerously disposed to snapping a chain at any instant, limbs flailing in a wild and abusive cacophony that somehow results in forward momentum. Amidst the kind of swerving and rocking and rolling up the climb, the descent is met with a loose, choppy style that defies both the laws of physics and of cumulative probability. Starting this way, I soon found myself sitting with Tobias and Shaun in a state roughly analogous to that of supercritical failure, or perhaps risk of spontaneous combustion. This is the inevitable corollary of the reckless racer boy – the earth shattering kaboom. In instances like these, I usually revert to another cliche. There’s a trash talker in every bunch and every race. The person whose concept of wit is incisive and perfectly timed remarks. Perhaps the most legendary is known for remarks such as “I thought you were having an attack…” or perhaps to a Canberran at Stromlo…. “I thought you were a local”. In my case, this usually transforms quickly into Dad jokes. I’m quite excited about the prospect of becoming a dad one day, simply to utter forth such nuggets of cringe-inducing gold that my kids will hate me, notwithstanding present failings at fulfilling fundamental biological imperatives. Rattling off such wit, the actual dad in the race was soon so embarrassed he chose to gallop off up the road, and I’d soon lost the leading pair. Over the next few laps, things started to go a little downhill for me, and not just in the sense of enjoying the descents. I lapsed into the most regular cliche of them all – the self-absorbed athlete. The Self-Absorbed athlete is so wrapped up in their owns paroxyms of performance that they don’t actually enjoy a minute of it. Quite frequently, they actually break themselves before the start, and stand around hoping the race might actually be postponed. The self-absorbed rolls around the track, elbows out, face a studied expression of stoic and heroic suffering that will hopefully make a re-shared photo later on, focused beyond the point of talking to anyone else, and serious beyond measure. The excuses compile and self-perpetuate. The vacant thousand mile stares abounds. The rationalisations emerge. The sickness the week before. The poor week of training. The fact that the Australian Sports Commission won’t pay for the 3 week European holiday. This all came to a head about 3 hours in, when I noticed a smooth-looking rider chasing me for a couple of laps. I struggled bitterly, bouncing off rocks on the descent, and mentally preparing my train of thought for justifying a DNF. This low point was suitably relieved when I discovered, shortly after being passed, that this (rather nice!) chap was actually riding in a pair. Suitably relieved and relaxed, the course and universe in general became rather fun again. Perhaps this just coincided with a caffeine gel, but I soon transformed into another cliche: the disturbingly chipper lunatic. Riding around with an absurd grin, doing jumps, making incredibly bad jokes, and attempt to strike up conversations with all around. The problem for the Disturbingly Chipper Lunatic is that this chipper, happy behaviour can seem rather insincere and callous to those who are struggling. Enter the scenario – riders struggling up the horribly steep fire-road pinch in the cold, with tired legs, tired bodies, and creaking bikes. Lunatic: Oh really? I’m riding solo and I’m just starting to have fun! Innocent Bystander: …. You’re a jerk. Lunatic: Have a good one! You’re doing really well, keep it up! Innocent Bystander is later shocked to find out that the Lunatic was, in fact, actually enjoying himself, and not just trying to be a jerk. The Lunatic was leaping off rocks, enjoying the sweet hurt on the climb, and generally having rather too much fun on the track. The climb represented the challenge. The rocky pinches were the joy of the moment. The slick descent the sheer adrenaline rush of descending on two wheels. These were happy hunting grounds for lunacy. Tobias – finishing up in second – could be described as a lovely monster. Or, in fact, the loveliest monster on the planet, with an infectious love of the sport and riding up hills only matched by the speed with which he does it. Riders lie awake at night, terribly afeared of this monster, devouring Everests at a rapid pace, only later to say “I was just having fun!” while the self-absorbed athlete is thinking all sorts of dark and dreary thoughts about retirement, coffees in the sun, and taking up trail running. The guy a minute up the road represented another cliche, but one rarely found, if much aspired to, particularly amongst cliche # 3: the #pro. The #pro operates with effortless style. Somehow lacking in mud, somehow flying down descents as fast as ever, polite in passing, and effortlessly efficient at every single turn. A marketing shot without the insincere flurry of desperate hashtags, and a race perfectly executed with calm precision. The race, up the road, can only be recalled from what I saw. Shaun utilised skill and smooth lines to open small gaps on the descents, with Tobias marginally stronger on the climbs, but working harder every lap to close the gap. In a battle of conservation of energy, Shaun eventually prevailed in a protracted ding-dong epic. Still, to race around in the presence of monsters and #pros is pretty good fun, if only to hang around for an hour. 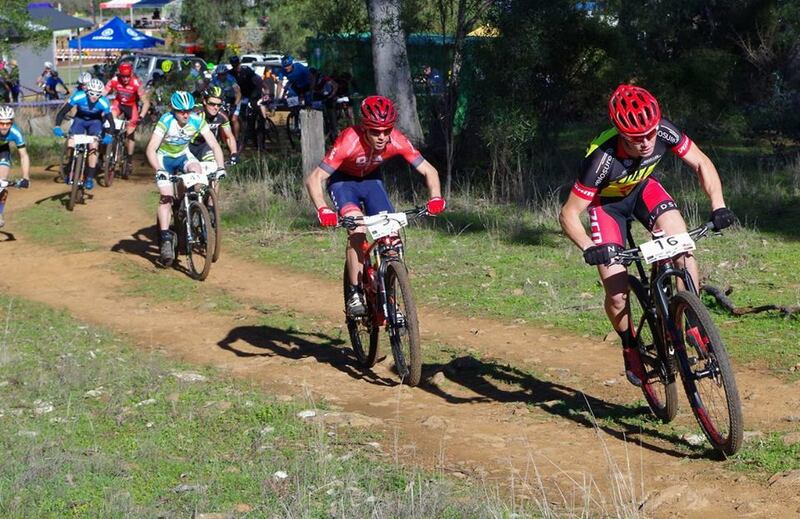 A big thanks to Albury Wodonga for another excellent race on a fun track – I’ll vote for Nail Can Hill again in 2017 instead of smooth trails and berms! Thanks as well to those who keep the lunacy alive, in particular, Onya Bike Civic, for keeping the Anthem running like new. Most people dread the onset of winter. The frosty mornings, the bitter winds, and the abysmal, all-encompassing dark – long days at work punctuated by deep, cold darkness at either end. In the immortal words of pop culture, its coming is as inexorable as Game of Thrones quotes themselves: winter is coming. In the depths of the approach, some withdraw, hibernate, embrace the warmth of the doona. Going gently into that cold night – rage, rage, against the dying of the light. For those rare moments escaped into the sunlight, it is truly glorious – the warmth of distant ball of fury piercing the crisp morning air. Winter brings the promise of adventure to new places, exploring new terrains, and roaming the great expanses of a Wide Brown land, without fear of sunburn, heat-stroke, or that constant lingering fear of dehydration. Sometimes you are privileged enough to ride with some fantastic folk and go on some good adventures. Every now and then, these people go on to do amazing, inspirational things. The below photo is from the start of the Fitz’s Extreme in 2014, shortly before Seb and Beth transitioned into BikePackingBeastMode. Over the next year, Seb and Beth Dunne smashed out a Kiwi Brevet as a practice ride, then proceeded to ride the Tour Divide at cracking, epic paces, although in one case, with slightly too cracking a pace for a suspension fork. Edridesbikes sat down with Seb around a gas heater on a rainy Canberra night, with Seb’s cat Bruno purring contentedly on his lap, and the jovial manner of the conversation belying a steely glint of determination in his eye..
Talk us through the inception of the Tour Aotearoa, and the first Kiwi Brevet you did in early 2015 – where you emerged from long rides and almost broke the mythical 4day mark. NZ have been pouring cash into the construction of an ever increasing network of off-road trails in recent years. Tour Aotearoa evolved as a way for the Kennett brothers (authors of numerous guidebooks on NZ mtb’ing) to introduce a trail from the tip of the North Island to bottom of the South connecting a lot of these trails and other back roads along the way. Similar shorter events (Brevets) of around 1000-1200km having been running in NZ for a few years. January 2015 Beth and I headed across the ditch to ride the 1200km Kiwi Brevet around the top of the South Island as a training ride before the Divide. It was the longest event of this type I’d done before but managed to have an awesome time just doing solid but steady days trying to find a pace I thought I would be able to sustain for TD which was almost 4 times the length! I finished in just over 4 days and made me realise what a massive undertaking the Divide would be. From Kiwi Brevet it was all guns blazing for the Divide – what was your main motivation? I wanted to finish. TD is such a long event where so many things can go wrong you can never take it for granted that you’ll finish. Aside from that I hoped to enjoy the experience as much as possible. The route goes through some seriously stunning scenery and I wanted to be able to take in and savour this while still riding the sort of distance I was aiming for. I didn’t have specific expectations going into it but felt I had the ability and had put in the necessary training to have a competitive ride. It all went pear-shaped at the Divide in New Mexico – talk us through it. I’d just crossed into NM one evening and hit a small water bar at the crest of a hill. My bike made a bad sound which I got off to check as I thought my stem might have slipped and twisted. It had started to sleet so was walking my bike down to some trees and my front wheel separated from the bike. The steerer tube on my fork had sheared clean off. I knew straight away my race was done but was very fortunate to not be injured at all. Getting out was a bit of a mission. I think I was about 15km from the nearest road and would struggle to carry my bike that far. I started grabbing some gear to prepare to walk straight out that night but changed my mind as it was getting late and the weather had closed in a bit. Dylan Taylor had caught up and said he’d try to get a text out later which I hoped would navigate the interwebs to my family so they wouldn’t stress. Walked out the next day and was fortunate enough to get a lift to Chama after less than 10km where I took the Cumbres steam train which was leaving shortly mainly because lunch was an all you can eat buffet and a city on the other side seemed like it might be an option to source a new fork. You caught up with Biking Bethany and finished together. New Mexico sounded like the hardest part. New Mexico is hard! Colorado, although generally at higher altitudes, has nice steady climbs and smooth, well-formed roads and generally plenty of resupply options – it was probably my favourite State. Almost as soon as you cross the State line into NM the tracks deteriorate and there are several tough 200+km sections with no or limited scope for resupply. I struggled at times even having had a 3 day off-route holiday eating and sleeping while I got a new fork sorted. Perhaps my body had started to go into recovery mode and wasn’t all that happy about riding again. Beth has been doing some really long days before I joined her so she was pretty knackered and I found it difficult to see her in the state she was in. If Beth wasn’t there I likely wouldn’t have finished TD last year so I was grateful she was happy for me to ride with her. We got on with the job at hand. We both had a few really hard days toiling through NM but there was comfort in suffering through the struggles with the person you loved. Finishing together was a bit of a blur after riding all night but something very special that we had both dreamed about doing and is a memory no one can take away from us! Talk through your relationship with Beth – you guys have shared some crazy adventures and have shared some amazing experiences together. How has Beth shaped your riding? We met through riding but both did relatively tame stuff back in those days. Since then we have definitely both grown a lot as riders. Our thirst for bigger challenges and adventures has fuelled of each other. Beth has always been a bit more active a racer than me. I’ve usually been content just riding my bike. In recent years Beth has had times where she has been racing XC and 24hr MTB races before turning back to her cycling roots on the roadie and spent a few seasons racing the National Road Series. Bikepacking became the next channel for her to challenge herself and satisfy her need for adventure. I used to do more running than cycling with orienteering and adventure racing my main past times. I’ve always been a terrible runner though and increasingly found it took a toll on my body which cycling didn’t. Cycling was something we could enjoy together and I seem to have done more and more since we met. I think the main influence she has had on my riding is her attitude of just going out and trying something rather than fretting about whether it’s a good idea or not. There’ll always be reasons not to do something or ways to justify spending more time thinking about an idea but sometimes you just have to launch in to something and give it a go. – Tour Aotearoa – you didn’t really prepare as hard as for the Divide and seemed pretty relaxed, and made the whole thing look rather too easy. What were the best parts? I didn’t really do much specific training for TA other than some steady volume mainly on the road over summer. Certainly nothing near what I did for TD last year. I focussed more on knowing the route and hoped I could wing the rest – I think it worked out OK.
Aside from the scenery which was sure to be spectacular, I think the best parts were the people – both locals and other riders. It ended up being a very social tour. Such a different experience riding with others. We had a fantastic group of like-minded people in the North Island which made the time fly even though we were covering good kms. Like a series of Survivor bikepacking style, the group got smaller and smaller and eventually I ended up riding with Ollie and had an absolute blast navigating most of the South Island together. I estimate I only rode about 300km (10%) of the tour alone while I can think of at least 8 days on the Divide I didn’t see another rider. 6am coffee and cream buns in Wanaka before a frigid dawn ride over the Crown Range singing Shania Twain with Ollie springs to mind as a great moment. One of those times where the ridiculousness of these adventures is very apparent. Another highlight was the West Coast Wilderness trail which was probably my favourite section of the tour. A fantastic, purpose built trail between Greymouth and Ross. I’d had a bit of a tyre/tube debacle in the morning so was riding solo again an hour or two behind Ollie. Managed to score a nice sunny afternoon with cracking West Coast scenery and loads of people out enjoying the trail. Some of my fondest memories of the ride. I’m sure there weren’t that many, but what were the worst parts? I was fortunate enough to not really have too many bad bits. We realised we would likely come in under 10 days (the event isn’t a race so imposed a 10 day minimum finish time) so we backed off a bit the last few days which meant finishing a lot fresher than in previous tours. Also the mandatory 6hr stop each day means it isn’t an exercise in caffeine fuelled, sleep-deprivation. I really like the format of the NZ brevets. I did have a bit of problem with my breathing the first night so I stopped early to recover but felt better the next day. Think it might have been related to the warm and hard ride down the beach and to make the first ferry. We got super lucky with the weather. Only sustained bit of drizzle was one evening riding over Rahu saddle and up to Big River Hut. I felt bad for riders who copped some pretty nasty weather later in the event. The stench from Ollie’s shoes was probably one of the worst parts. We shared a cabin on the ferry to Picton and his shoes already stank even though they were barely 24hrs old after his original pair got flogged in Wanganui and he had to buy new ones! I’m sure he would have some stories about my odours though…..
What were the mental tricks for getting through the worst parts? I try to not take things too seriously. It’s just riding bikes for fun…..a long way. Sing a song, have a laugh, take a break, check out the scenery, stop and smell the roses. In these long rides I find emotions change frequently. Whatever you feel now you’re sure to feel something different in 30 minutes. If you’re feeling down it will get better and if you’re feeling good just enjoy it as it likely won’t last forever. Another trick is not to think about how far away the finish is….this can just be demoralising. I try to break things down into smaller more manageable goals. This usually involves thinking about my next meal! Typically in the morning I’ll grab something to eat straight away just to try and get some fuel in to the body first thing. Gear on next including an extra layer to make sure I start riding as warm as possible. Roll away the sleeping kit, check everything packed onto the bike OK and give the chain a quick lube if I didn’t do it the night before. Sometimes a quick bit of body maintenance (teeth brush, chamois cream etc) depending on how I’m feeling and then get rolling. Aim for 10-15mins max from alarm to on the road. Next plans? Another crack at the Divide? Yep am in for the Divide this year. I honestly didn’t think I’d ever be back after last year – not because I couldn’t face it or anything but because there are so many other things out there I’d like to do. TD has a way of getting under you skin however and late last year though the idea of returning started growing on me. Before I knew it a few things had fallen into place, I’d booked flights and off I go. It looks like being another super strong field this year. Excited at the prospect of another crack and chance to put my best foot forward with the experience of last year fresh in my mind.